The 13th annual Joyce Country Challenge will be held on Saturday 20th July 2019. The Joyce Country Challenge gives you an opportunity walk one of Ireland's hidden gems. Taking the plateau of 'Maumtrasna' and the 'Devils Mother' this circuit of Lough Nafooey is an area of natural beauty often overlooked by Ireland's walkers. With outstanding views of the Maamturks, Mweelrea, Killary harbour, the Sheefrys and the Western Lakes. B Walk: This is a lead walk, leaving Finney and ascending Ben Beg and Bunacuneen, returning to Finney along the shore line path of Lough Na Fooey. 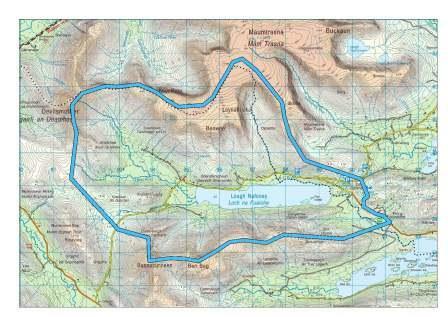 Length 20km Approx, 1000m ascent, expected duration 7 hours.There will be a break for refreshments at Ail Dubh. Walk C: Introduction to Hillwalking: This will take in the hill behind Finny Hall, which is 372m high and onward to Kilbride. Expected duration is 3 to 4 hours. Walk D: Ramble: This will be 12k road walk in a scenic area taking view of Lough Mask & Lough na Foohey. It will be lead by an experienced leader with good local knowledge. Its all road so best to wear good runners. PLEASE NOTE: The Challenge is for self navigators, this walk will not have a leader. Registration: Entries taken on the day, or pre-register by emailing form and submitting payment online.